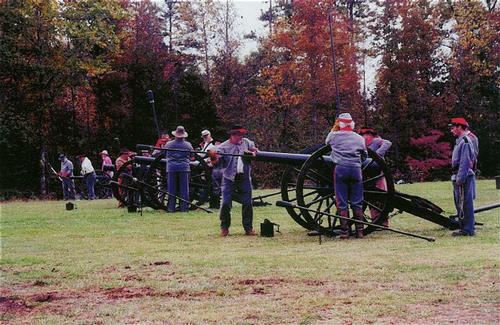 By 1:30 Stuart's patrols began to make contact with union vedettes covering a ridge at an angle to the confederate line of march. Stuart, finding himself in front of a solid column of federal infantry, ordered a charge to break through the cavalry vedettes and hit the head of the advancing enemy. 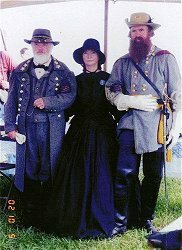 The same orders were sent back to the confederate infantry, as they formed up in response to the brisk firing to their front. The cavalry charged gallantly into the vedettes pushing them back on their grand guard as it formed to attack. The resulting charge and counter charges sent the hastily formed federal cavalry staggering back on the column of advancing infantry. Several platoons of charging confederate cavalry met the head of the federal column as it formed their battle lines.Â This temporary disruption in the formation gave Stuart's horsemen the opening they needed to smash into the maneuvering enemy. The battered lines eventually formed and several solid volleys persuaded the attacking horse to fall back. 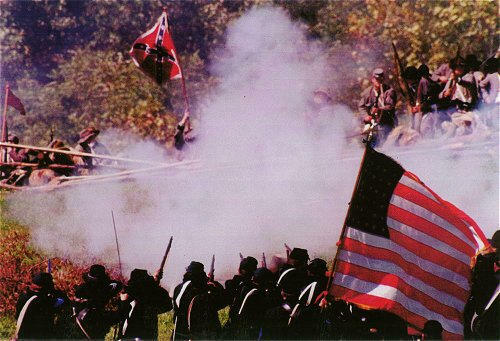 The federal lines, once formed, pushed the attacking squadrons down the ridge towards the still forming confederate infantry. Stuart quickly dismounted his cavalry and sent them forward to delay the blue battle lines. Muskets and carbines at shoulder arms, the gray cavalry moved uphill to toe to toe with the bluecoats. Repeated charges were made each causing the federal battle lines to stop and repulse the onslaught. The depleted ranks of dismounted cavalry were withdrawn only when the ranks of Confederate infantry formed for a decisive counter punch. As the gray battle line surged forward the veteran union lines pored in several volleys with devastating results.Â Only after a charge did the Confederate infantry stymie the initial thrust of the enemy.Â After stabilizing, the federal troops began a slow deliberate withdrawal to the crest of the formidable ridge.Â Once in place, they threw up makeshift fortifications and dared the graybacks to come visit. An uphill charge into fortified positions is dangerous and expensive in lives lost. After a brief conference, Gen. Stuart mounted his cavalry and took them from the field and towards the federal left flank.Â As the confederate infantry surges forward, Stuart's cavalry swept around the heights and into the vulnerable federal flank. The Southern battle line poured a devastating volley into the federals as the cavalry made the desperate flank attack into the exposed enemy line. 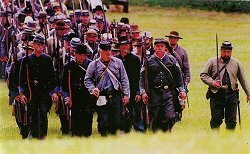 Within minutes the blue line fell back with the order and precision of the veteran troops they were.Â As the southern battle line formed on the captured ridge, the federals reformed in the woods, and planned their next move. Shortly the federal drummer boys began their tapping and a strong union battle line emerged from the woods. The steady quickstep and alignment gave notice that a hard fight was in the wind. The hard-pressed southern ranks simply did not have time to organize and consolidate. With mounting pressure, the southern ranks began a slow, somewhat disorganized withdrawal. Re-crossing the hard fought ground left the determined federal infantry in possession of the field. 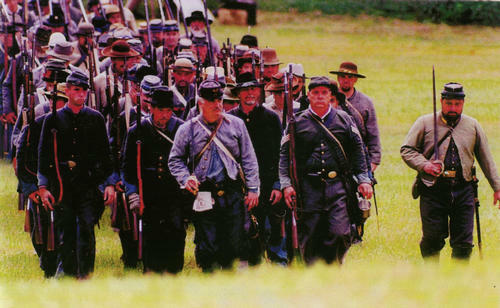 The lull in the fighting gave the southern infantry some respite as they reformed and solidified their line. The cavalry, however, sent patrol dashing after the retreating federal cavalry to harass and shadow their movements. 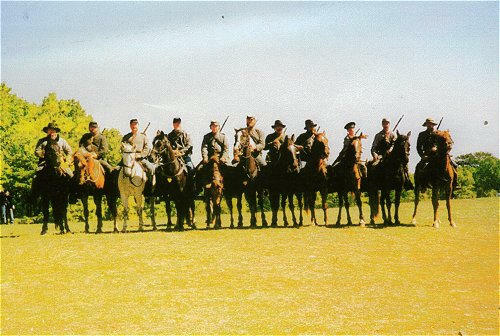 Within minutes the scouts and patrols came scampering back with a full contingent of federal cavalry in close pursuit. Gen. Stuart at once notified the infantry that with the increase in cavalry it was very likely the infantry had been reinforced also. 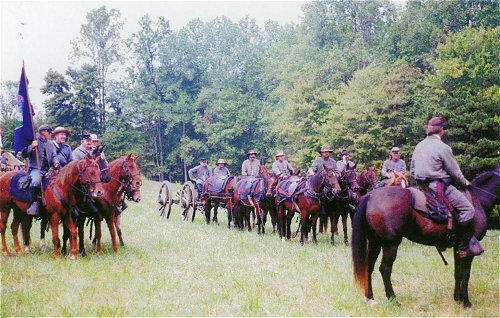 The confederate infantry had hammered it out with their blue counterparts, now with the added federal mounted units the confederate horse would have to follow suit. 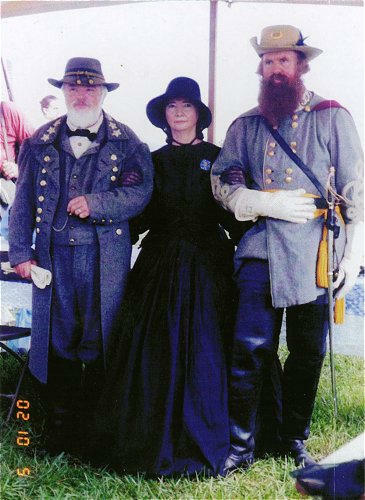 General Stuart led the gray riders headlong into the blue battle line. Charge was met by counter charge. Rally followed rally, until the southern effort cleared the field of the union horse. This period gave the stubborn confederate infantry an opportunity to solidify their lines. The federal riflemen would be hard put and desperate men. A southern victory would not be without cost. Officers straightened their lines the bugles sounded and the drummers picked up the pace. The gray line moved forward with the grim determination of hard-core veteran troops. Facing the onslaught, the blue infantry listened for the drumbeat of their own drummer boys. The steady beat, 1-2-3, of ready aim fire! The devastating fire shattered sections of the southern line. They simply closed rank and continued on. As the union line re-loader the gray line halted. The same drumbeat poised the southern guns. The southern line fired.Â Unlike the men in blue the gray line leapt forward. They surged forward crashing into the stationary blue line. Unable to hold the union troops fell back and re-grouped. This time they had had enough. The battered gray backs were content to let them leave. This engagement is over. Both sides lick their wounds, knowing full well there will be more of the same soon. With an abiding faith in the God of battles and a firm reliance on the saber, your success will continue. Let the example and heroism of our lamented fallen comrades prompt us to renewed vigilance and inspire us with devotion to duty.